This story starts on a bike rather than in a canoe, since that’s how I learned this little trick. I’ve always ridden bikes---a lot. One time while we were kids, my brother and I both got a beating after riding about 25 miles up into Pennsylvania to get a sundae at Pennsupreme Dairy. Having been AWOL all day, when we finally got home in time for dinner, Mom greeted us with a warmer reception than anticipated. My brother, of course, even after I had paid for his sundae, reported that the whole trip was my idea, for which I was justly rewarded. We spent all our time on our bikes, and yet, in my first 60 years of riding, I think I only had one flat tire. When we moved to Oklahoma, Jean and I had three flats in our first month here---two on my bike and one on hers. The culprit here is sand burrs, carpet upon carpet of them, everywhere. I went to The Bike Shop in Enid, the best supplier of biking gear in the Northwest part of the state. Micah, the shop owner, recommended using tire liners along with the new tubes. We’ve used them ever since, going on eight years, and have not had another problem. One of the most valuable pieces of paddling gear, especially for expedition paddling, is a good boat cart. I got my PaddleCart from paddlecart.com. They are made for kayaks or canoes, and come with either single or dual wheels (4-wheels). The cart is of little value, however, if you can’t avoid flats, and having a flat on a long portage with a 70-pound canoe and 150-pounds of gear and provisions can put you in a real jam. Since many of the areas where we launch and retrieve are likely spots for finding burrs, briars, broken glass, nails, tacks, and other debris, tire liners in the paddle cart tires are just as important. 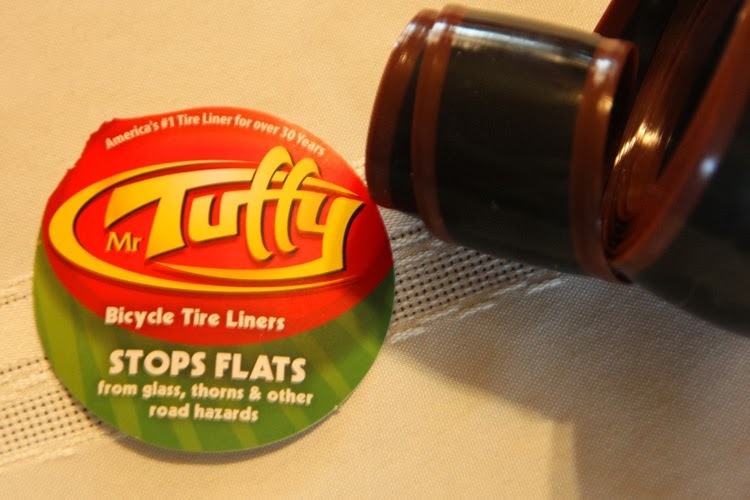 I’ve used two brands, Mr. Tuffy and Stop Flats2. Other than the brand name, I can’t tell them apart. They consist of two layers of tough rubber that you put inside the tire between the tire and tube. They should last forever, and indeed come with a lifetime guarantee. The tire liners come in an assortment of sizes to match different tires. For my paddlecart, I just used the same size I use on my mountain bike, and they seem to be working perfectly. The ends of the liner should overlap a good bit, so while my liners are for 26” bike tires, I cut them in half, and they still overlap nicely, and do two of my 12 ½” cart tires. They come wound in a tight roll, and especially in cold weather, are like working with spring steel. To make them much more user-friendly, roll them up in the opposite direction and put a rubberband around the roll. Let them set awhile in the warmth of the house, or in the sun, and they will straighten out considerably. Remove the tube stem valve to deflate the tube, and remove the tube and tire from the rim. If you’ve had a flat, especially if it’s something hard to find, like burrs, turn the tire partly inside-out and lightly rub the inside of the tire with soft cotton cloth, cotton balls, or even dryer lint, which will catch on the projections inside the tire and make them easier to find. Using finger tips will help find only the larger ones, but requires a bit more antiseptic. Roll the liner into the tire. Put a little light oil on the stem valve, which Micah also suggested will make them seat better and prevent stem leaks. Put the tire back on one-half of the wheel rim. Reinstall the tube valves and put just a couple pounds of air in the tube to give it shape. Stuff it inside the tire, making sure the liner stays in positioin against the tire. Start with the stem first, as getting it in place keeps the tube aligned with the rim and prevents wrinkles in the tube, which will lead to tube failures. I know most of this is old hat for people accustomed to changing bike tires, but when putting the tire the rest of the way on the rim, whether using an iron or two wide-blade screwdrivers, be certain not to pinch the tube against the rim, as this will likely cut the tube. Put a few more pounds of air in, and bounce the wheel a number of times on the workbench or floor, helping to work out any remaining partial twists or wrinkles in the tube. Then, inflate the tire to its recommended pressure. With the job done, you should fear little in the way of flats on your paddlecart, making for much happier paddling.